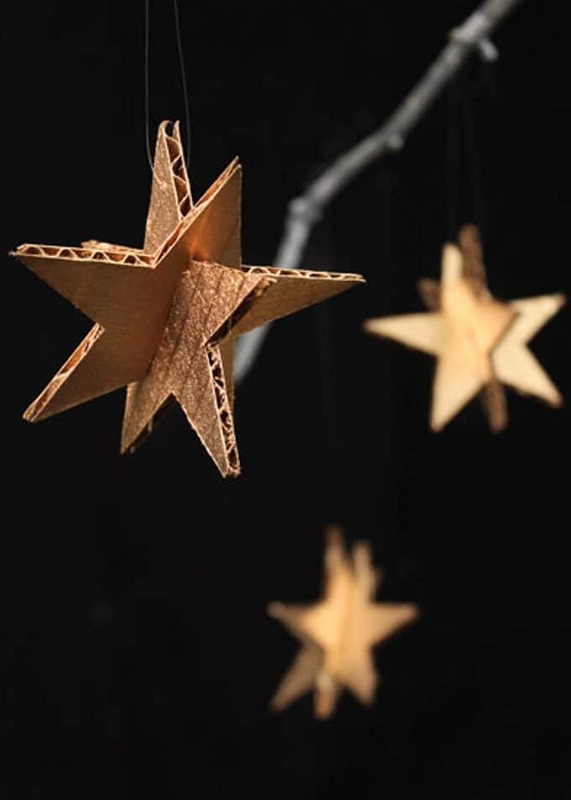 Decorate your home for the holiday season with these 16 homemade cardboard Christmas decorations —use them to trim the tree, tie onto a package, top your table, and so much more. The best part? 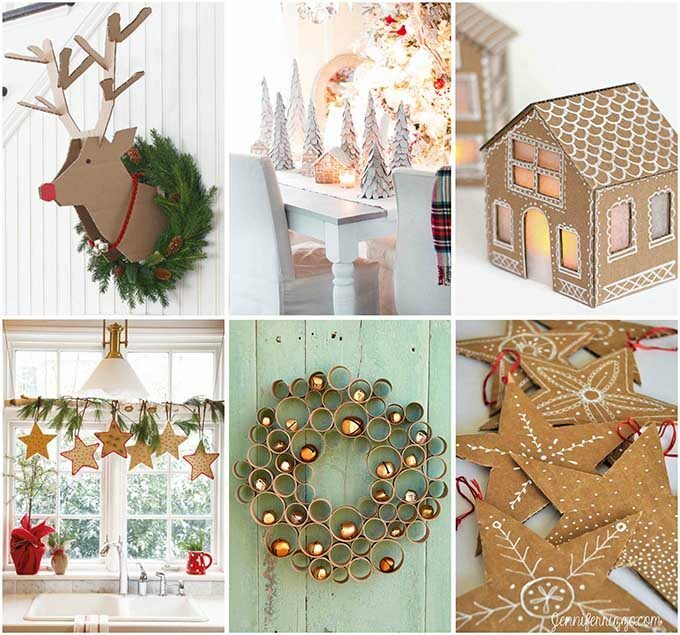 The 16 craft tutorials below can all be made out of recycled cardboard and cost just pennies! Cardboard has to be the best craft material ever invented. 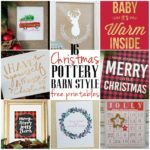 It’s cheap (or free), readily available during the gift giving season, and easy to turn into crafts. The warm brown color calls to mind gingerbread and wood, but it's much easier to shape and cut. 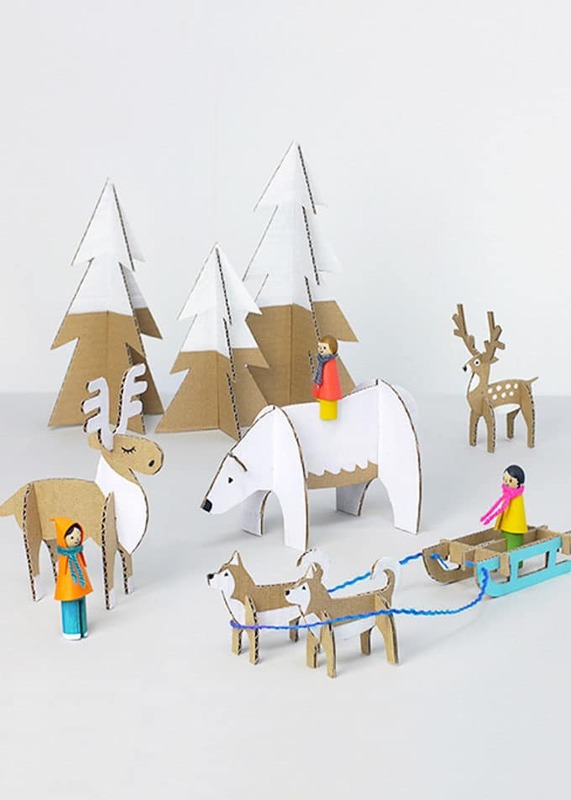 My kids love making cardboard Christmas decorations, too. The material is sturdy enough to stand up to little hands and, if they make a mistake, it’s easy to try again with a new box. No expensive craft materials wasted. 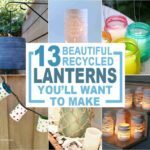 Grab a cardboard box from your recycling bin, choose one of these gorgeous ideas, and get crafting! 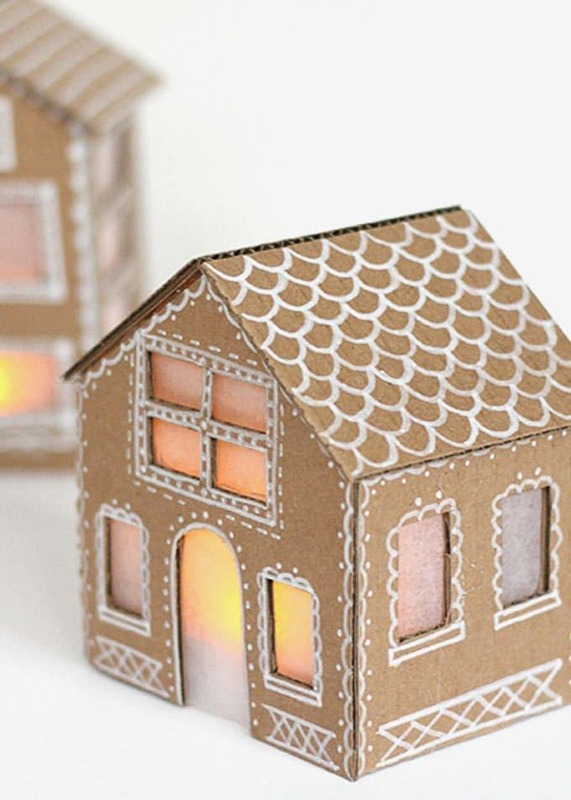 Tiny Cardboard Gingerbread Houses – These adorable cottages from Little Red Window will last all season long. Bonus, no sticky icing fingers! Snowy Tabletop Christmas Trees– Makes a snowy forest of pine trees with this easy tutorial from Craftberry Bush. Winter Wonderland Animal Scene – Kids will love making and playing with this animal filled winter scene. 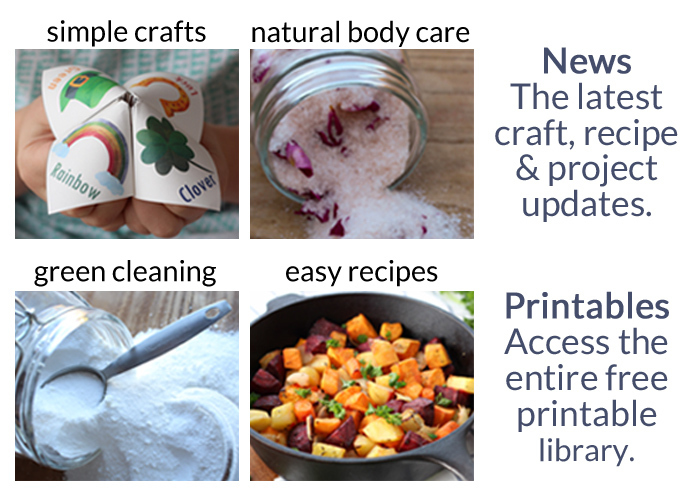 Get the tutorial from Mr Printables. 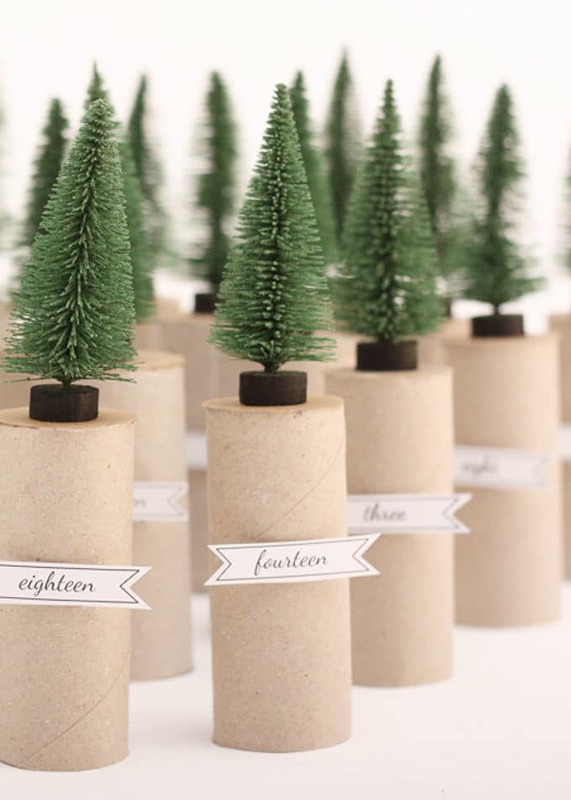 Toliet Paper Roll Advent Calendar – This simple and beautiful Advent Calendar is made from toilet paper rolls and mini trees. Get the tutorial from Morning Creativity. 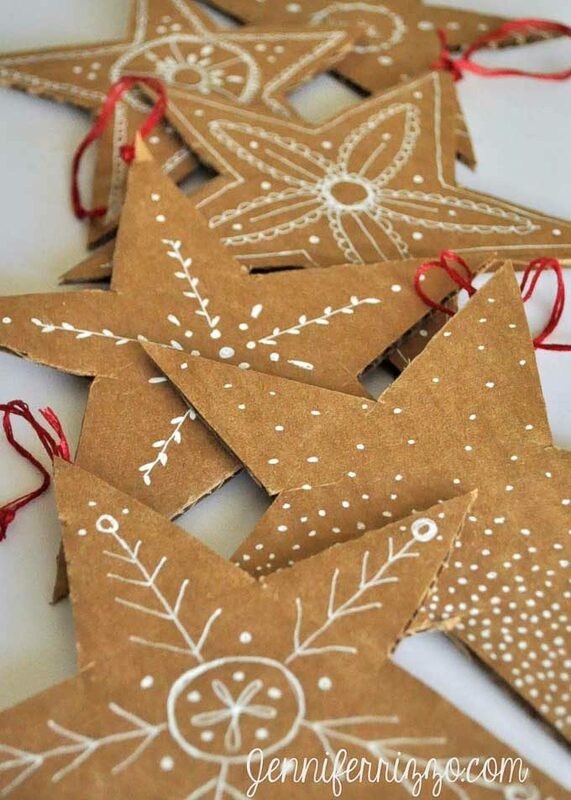 Hand Drawn Cardboard Stars – Use a gel or paint pen to decorate these gorgeous star ornaments. They look good enough to eat! Tutorial from Jennifer Rizzo. 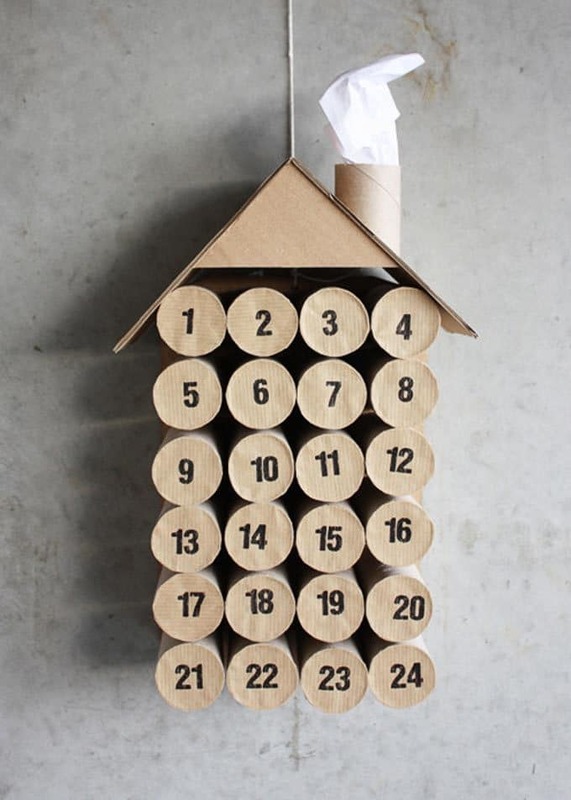 Christmas Advent House – Turn toilet paper rolls, a box, and some paper into a simple Advent house. 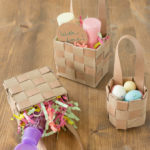 Easy craft from Morning Creativity. 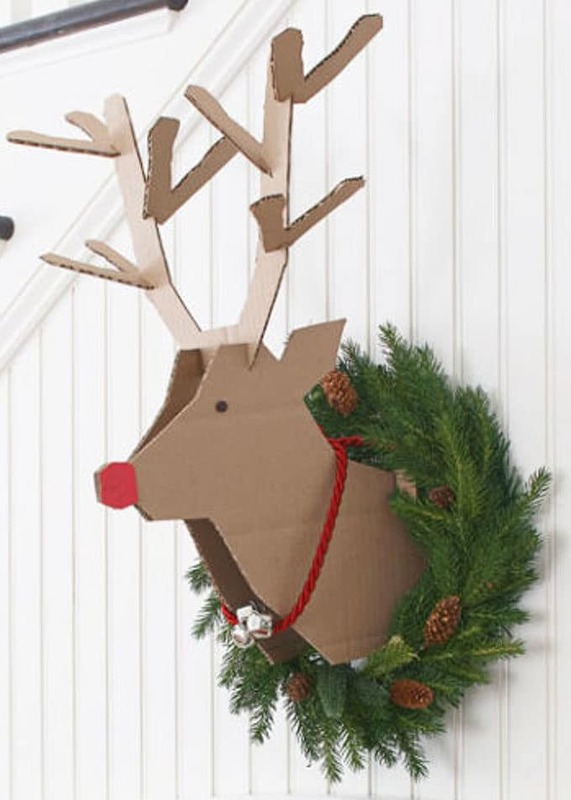 Scandinavian Reindeer Bust – Add a whimsical reindeer to your holiday decor. Template and instruction at Good Housekeeping. 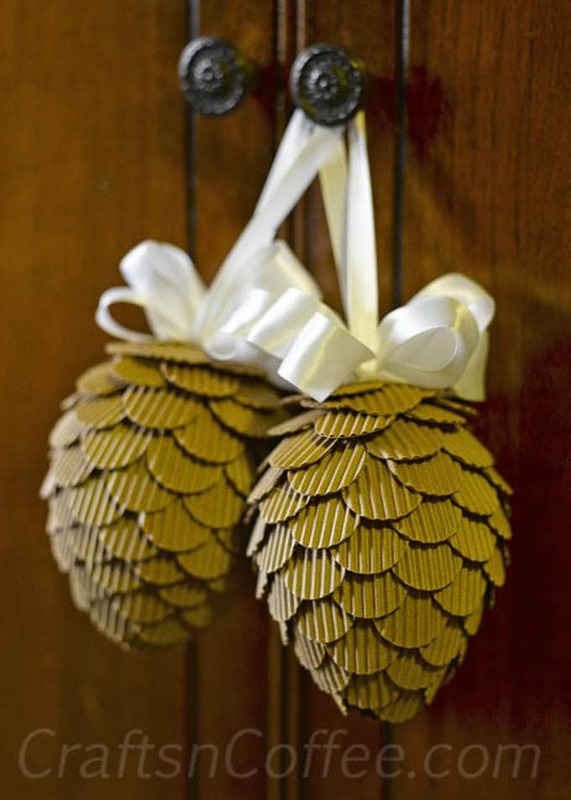 Corrugated Cardboard Pine Cones – Pretty paper pine cones are perfect for fall decor and can be used all the way through Christmas. Get the DIY from Crafts-n-Coffee. 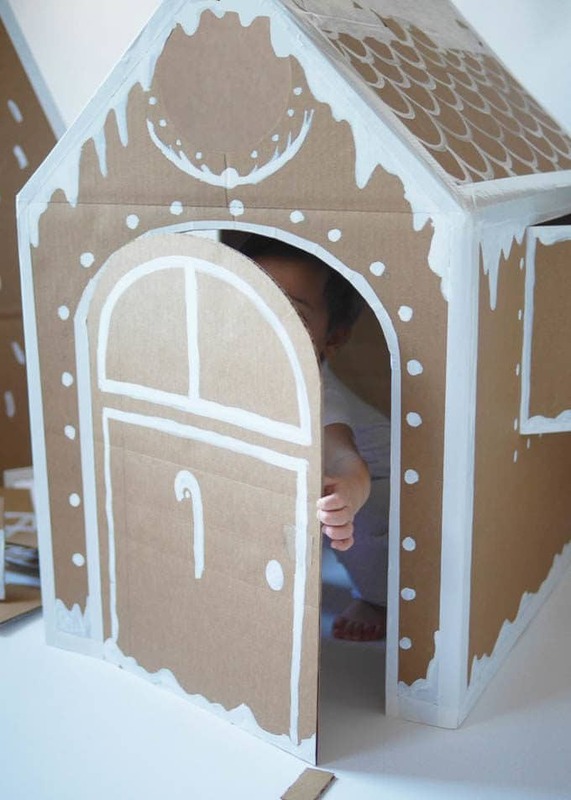 DIY Giant Gingerbread Playhouse – Kids trapped inside? 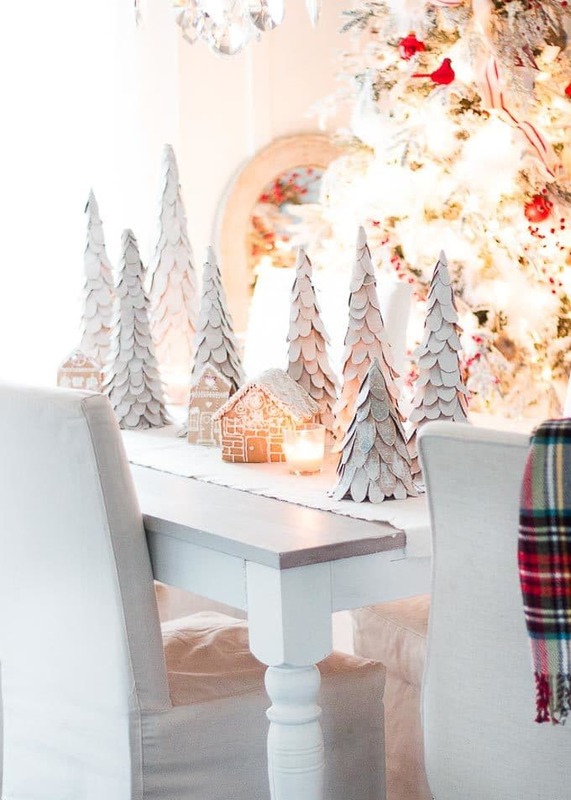 Make them their own gingerbread village with this easy ideas from La Maison de Lou Lou. Simple Christmas Trees – Make your own Christmas forest in 3 seconds flat! Get the tutorial from Pink Stripey Socks. Tiny Twinkle Stars – These sweet little ornaments will add sparkle and shine to the Christmas tree and all over the home! Tutorial from North Pole. 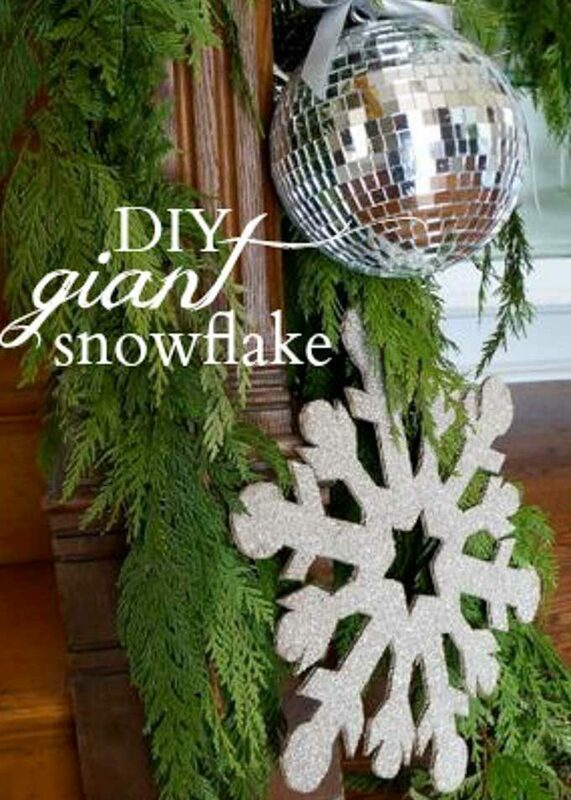 Giant Glitter Snowflakes – These 16 inches wide snowflakes make a huge statement all winter long. 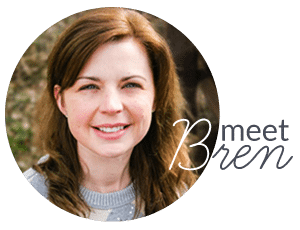 Get the template and instructions from Victoria Elizabeth Barnes. 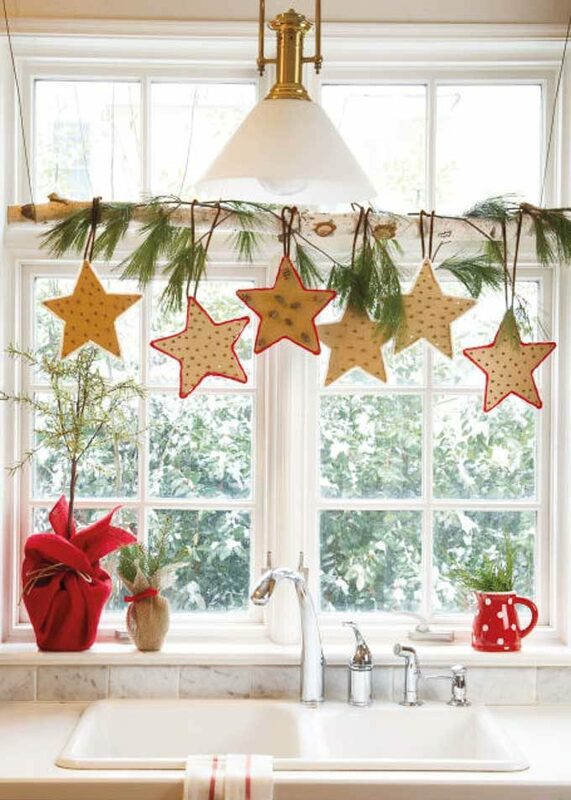 Clove Scented Star Garland – Spruce up your home with this simple window swag made from cardboard and cloves. Instruction from Woman's Day. 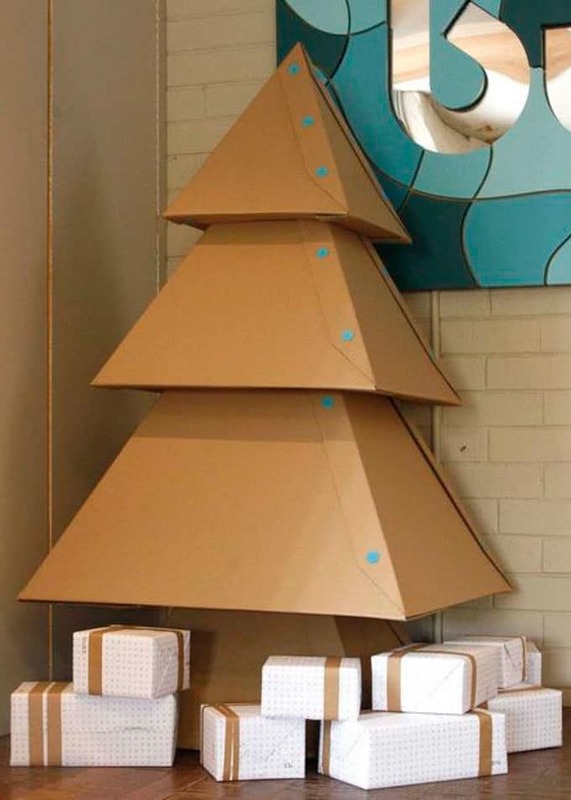 Full Size Upcycled Christmas Tree – Skip the tree and make your own from shipping boxes. 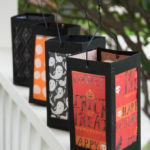 Get the template and instructions from Instructables. 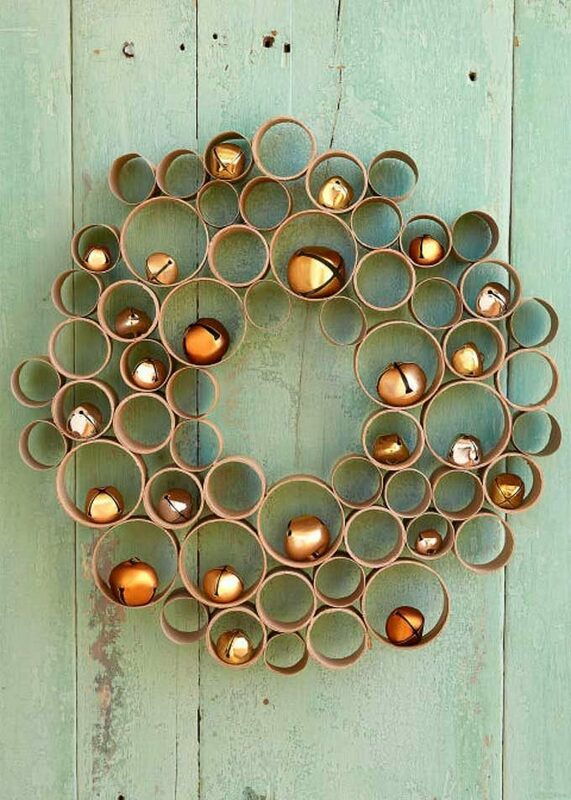 Honeycomb Cardboard Wreath – Turn empty mailing tubes, wrapping paper tubes, or paper towel tubes into this gorgeous holiday wreath. Instructions from Country Living. 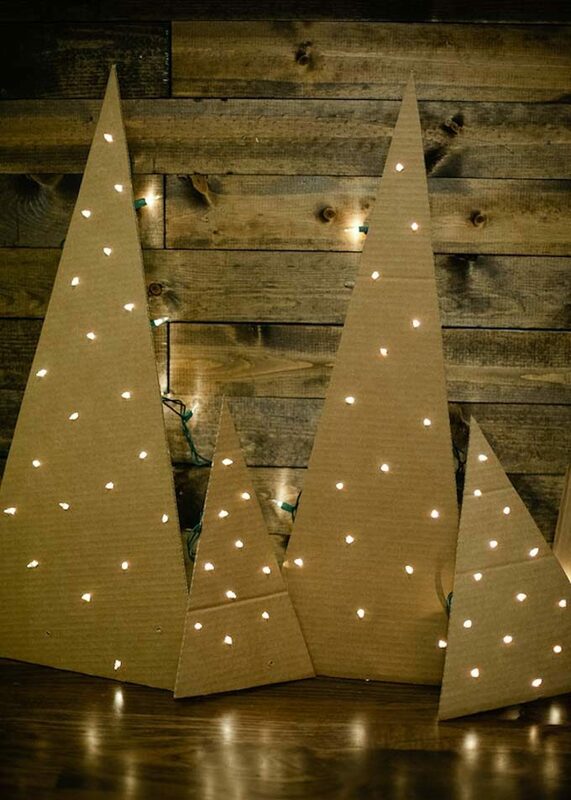 Flat Cardboard Christmas Trees – These simple lighted trees would be dazzling at a holiday party! Instruction from You Are My Fave. 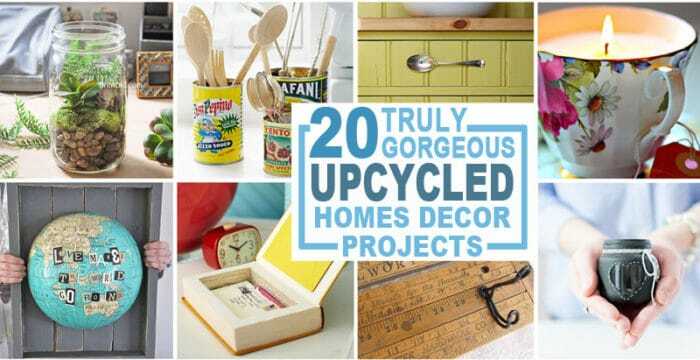 Love upcycled crafts? 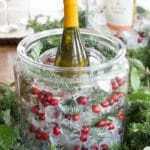 Check out these fun ideas for home decor! 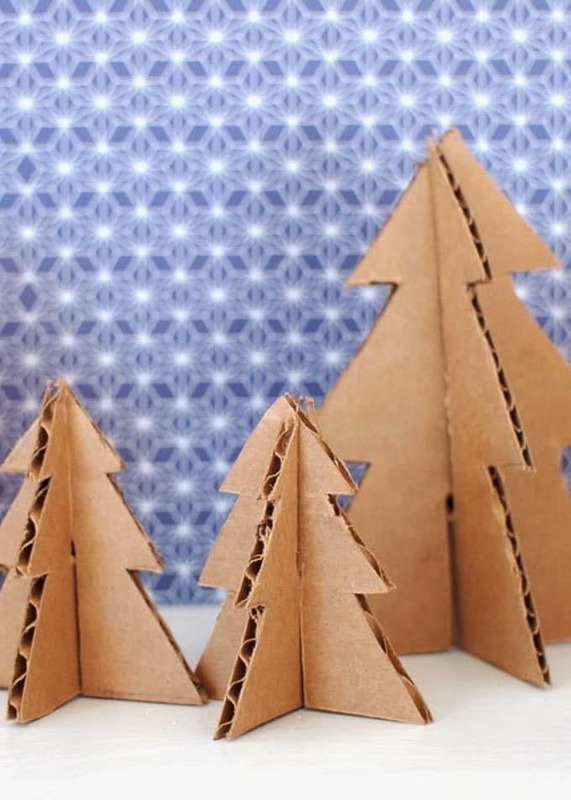 Like these easy cardboard Christmas decorations? Sign up for my newsletter below and never miss a thing!